O.K. I’ve already given you the recipe for making honeycomb pieces. Now here’s one for the ice cream! It’s a bit complicated, but if you’re feeling up for the task, please go ahead and test it as part of my ice cream party! 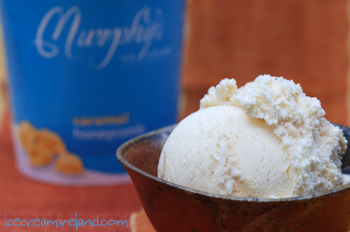 Over the years, this has been our best-selling ice cream in the shop, and I hope it makes you as happy as the thousands upon thousands who have enjoyed it in Dingle and Killarney! Pour the mixture back into pan, and place over low heat. Whip the cream until it has doubled in volume (donâ€™t over-whip!) and fold into the custard. 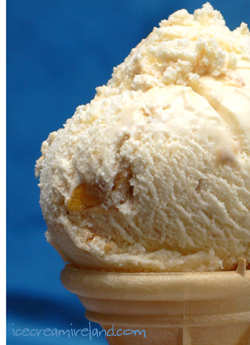 Freeze using a domestic ice cream machine, adding the honeycomb pieces and caramel sauce when it’s fairly solid. You can also just cover and place in the freezer, stirring every few hours, and again, add the honeycomb and caramel when it’s reasonably solid. Beware adding any more caramel sauce or the ice cream will get soggy. The part about adding the honeycomb at the end is important, as you don’t want the pieces melting in the ice cream. You will have extra caramel sauce left over, and you can always use it as a topping for the ice cream or to make a caramel sundae. 25K for a Dessert? Rats! I absolutely love your website! I don’t happen to own an ice cream machine =( but i was wondering if i could make your recipes for ice creams without one? Hi Rahul! Yes, you can simply cover the ice cream mix and put in the freezer, stirring every few hours to break up the ice crystals. Hooray! You’re the best, Kieran! I missed it when it went up, but now I can hardly wait to try. That looks amazing. Once my new ice cream maker arrives (so exciting) this will be high on the list of things to try out. Yum!!! Hi Kieran- Love your blog and this ice cream in particular. Question. When I add the honeycomb when ice cream is almost solid. The honeycomb is nice and hard. I put the ice cream in the freezer to harden it up after I take it out of our ice cream machine. When it comes time to eat 🙂 the Honeycomb has mostly dissolved into making more of a caramel ripple. How can i keep my honey comb crunchy? any suggestions? Am I adding to much or maybe I need larger chunks… Thanks for your help! Thanks for that and for commenting. It is a tricky flavour. We’ve always had some of our pieces dissolve as well. Freezing them faster helps, which is easy for us to say, since we have a blast chiller. However, if there’s any way you can make your freezer colder, you’ll notice a difference. Whats frustrating is as they melt, the sugar content of the ice cream rises, which makes the freezing process slower, which further exacerbates the problem. Larger pieces could help, or you could try letting the ice cream harden for half an hour or so after you take it from the machine, then stir them in. Finally, you could hold some back and serve them over the ice cream upon serving. Not ideal, I know, but at least they would be hard! I hope that’s some help. Just wanted to say thanks for responding Kieran. Instead of leaving my honeycomb on the counter until I make the ice cream, I freeze it over night. I know that sugar doesn’t freeze but cold sugar must work better I guess. So I would recommend larger chunks of honeycomb as you suggested (I did the size of American quarters and dimes) and freezing the honeycomb over night before making the ice cream. Love your blog. From a small town in Montana USA, My wife and I want to go Ireland one day and can’t wait to visit one of your shops. Or all of them!! What a great idea to chill the honeycomb pieces first! We’ll have to give that a test. Thanks! Love your site, includes all the information I am looking for. Honeycomb Ice cream recipe looks great, will have a try at it.